This is the reason I celebrate today. Happy Father's day to me! Yes yes indeed that is why we celebrate you fathers. Hope yours was a good one. If you are a good dad and do a good job raising your kids there is a very good chance they will not turn out to be bitter, selfish and petty like your gal pal Red Queen. Happy Father's Day, Josh! Cute pic of the girls...Charlie is getting super big! Chris - Thanks! I had a really good time. Matthew - Bitter? You keep bringing her up, and you're calling her bitter? What's that they say about the pot and the kettle? Kymm - Yeah - Charlie is getting big. And she's into climbing on stuff, just like her oldest sister. 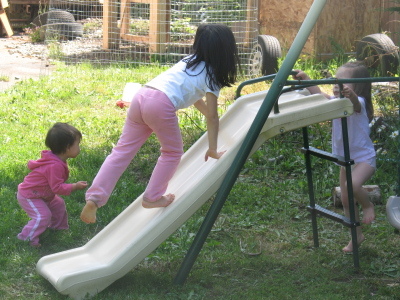 Charlie is already climbing up the slide... on the -slide- part, and then sliding back down. Crazy!